Welcome to the webpage of the International Shoulder Group! Here you can find information about our conferences, and resources related to shoulder biomechanics. Please get in touch on any of our social media channels, or by contacting our board members. 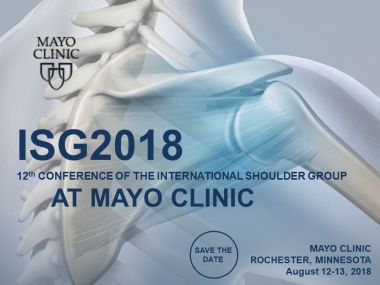 Our next conference ISG 2018 will take place at the Mayo Clinic, Rochester, Minnesota, USA in 12-13 August 2018, as a satellite event of the American Society of Biomechanics Annual Conference. Melissa Morrow and Meghan Vidt will co-host the conference. The organizers of ISG encourage the submission of abstracts on the entire spectrum of shoulder-related research and clinical application, including but not limited to glenohumeral kinematics/kinetics, clinical case studies, rehabilitation, ergonomics, musculoskeletal and orthopedic mechanics, prosthetics, cellular, molecular and tissue mechanics, imaging, motor control, computational modeling and simulation, and sports. The program will include an anticipated 7 podium sessions and 1 poster session, lab tours, and keynote lectures by prominent women in the field of Shoulder Biomechanics, including Dr. Katherine Saul (North Carolina State University), Dr. Lori Michener (University of Southern California), and Dr. Wendy Hurd (Mayo Clinic). Following the conference, participants will have the opportunity to publish full papers in a Special Issue of the Journal of Electromyography and Kinesiology. Please see the conference website for important dates and to submit your abstract. INAIL Prosthesis Centre, Bologna, Italy. Orthopaedic University Hospital Friedrichsheim, Frankfurt am Main, Germany. Are you a member of ISB? The International Shoulder Group (ISG) is a collaboration of mostly biomechanically oriented research groups, whose main interest is in the shoulder. The ISG has been a Technical Group of the International Society of Biomechanics since 1999. The ISG aims to enhance shoulder research by creating a platform for discussion and the exchange of information, software and data.